When Miss Pongleton is found murdered on the stairs of Belsize Park station, her fellow-boarders in the Frampton Hotel are not overwhelmed with grief at the death of a tiresome old woman. But they all have their theories about the identity of the murderer, and help to unravel the mystery of who killed the wealthy 'Pongle'. Several of her fellow residents--even Tuppy the terrier--have a part to play in the events that lead to a dramatic arrest. 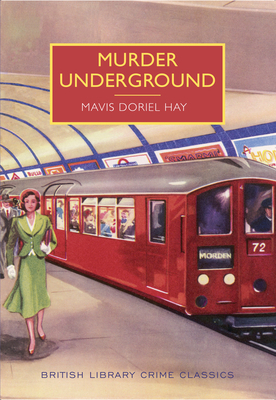 This classic mystery novel is set in and around the Northern Line of the London Underground. It is now republished for the first time since the 1930s, with an introduction by award-winning crime writer Stephen Booth. MAVIS DORIEL HAY (1894-1979) was a novelist of the golden age of British crime fiction. Her three detective novels were published in the 1930s and have now been reintroduced to modern readers by the British Library.